1. First and foremost, he is an amazingly talented chef on the Food Network. 2. Mario has red hair, like my handsome husband. 3. His wife’s family owns a dairy goat farm (I have a current obsession with goat farms after meeting Gretta of Gretta’s Goats). 4. Mario is a Midwestern man during the summer; he has a home in Michigan. 5. 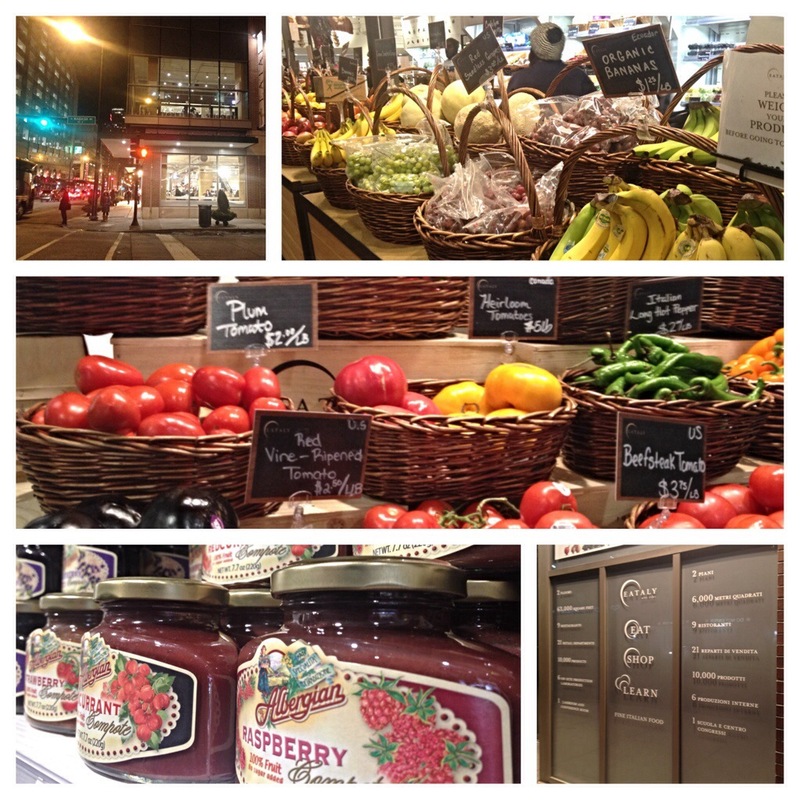 He—and his lovely business partners—gave me Eataly Chicago. I know I go to a lot of restaurants, but this one is oh-so-different. The first time I went (and, I confess, I’ve been back since! 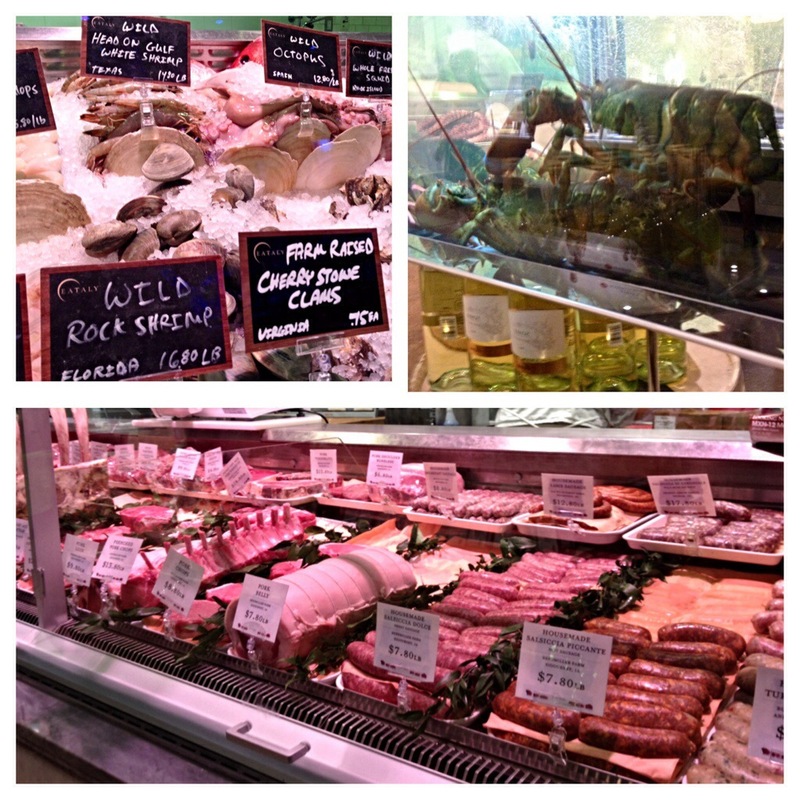 ), I was like a kid in a candy store—except my candy includes cured meats, cow’s milk-alternative cheeses, fresh pasta, a Nutella bar, and made-to-order sheep’s milk cannoli. 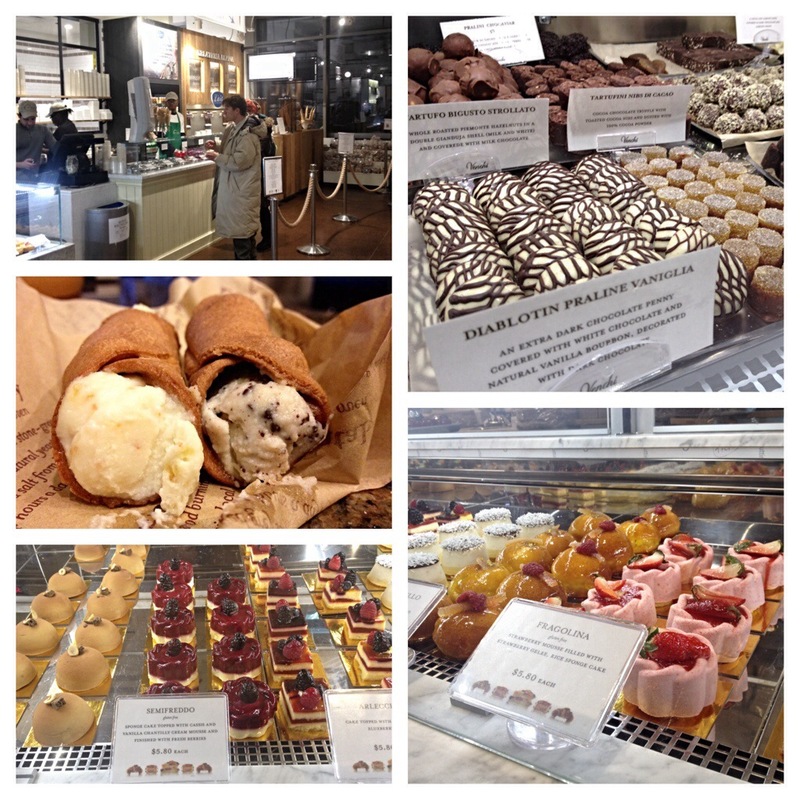 Eataly takes up at least a city block, and it’s a sensory overload from the moment you walk in. 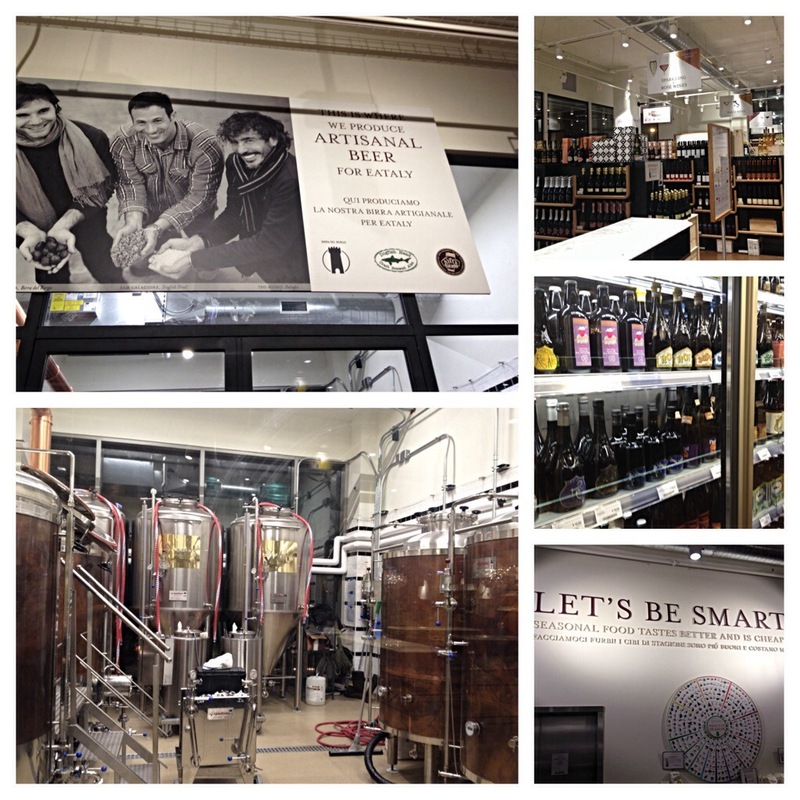 It’s two floors that consist of a fine Italian market, restaurant, brewery, and more, all in one. Because it’s a bit overwhelming, I’ve developed a system to navigate the space: walk counterclockwise around the perimeter of the store. It hasn’t failed me yet! 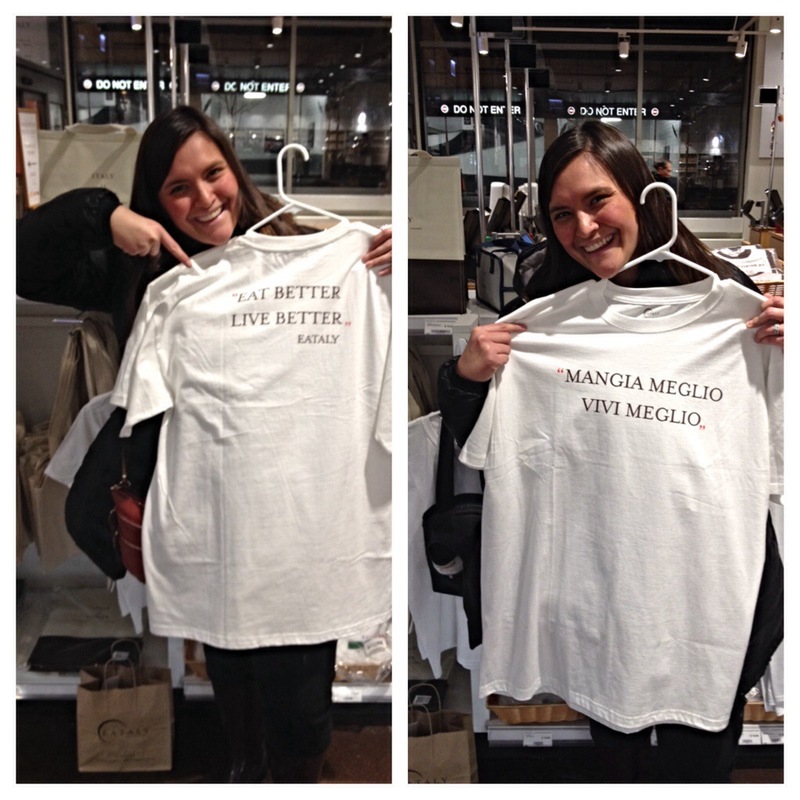 My first visit to Eataly was with my good friend, Lindsey. I took the subway from my office and arrived in 10 minutes (dangerously close). We wondered around the first floor, wide-eyed. It’s there you’ll find the information desk, produce, a Panini bar, a coffee bar, Nutella bar, gelato bar, sweets bar, housewares, packaged sweets, jams and jellies, and packaged dairy (milk, butter, yogurt, and eggs too). We walked up to the second floor, where we were greeted by a fried food bar to our left, cheese and cured meats to our right, and a wine bar directly in front of us. We opted for wine first: Prosecco for me and red for Lindsey. 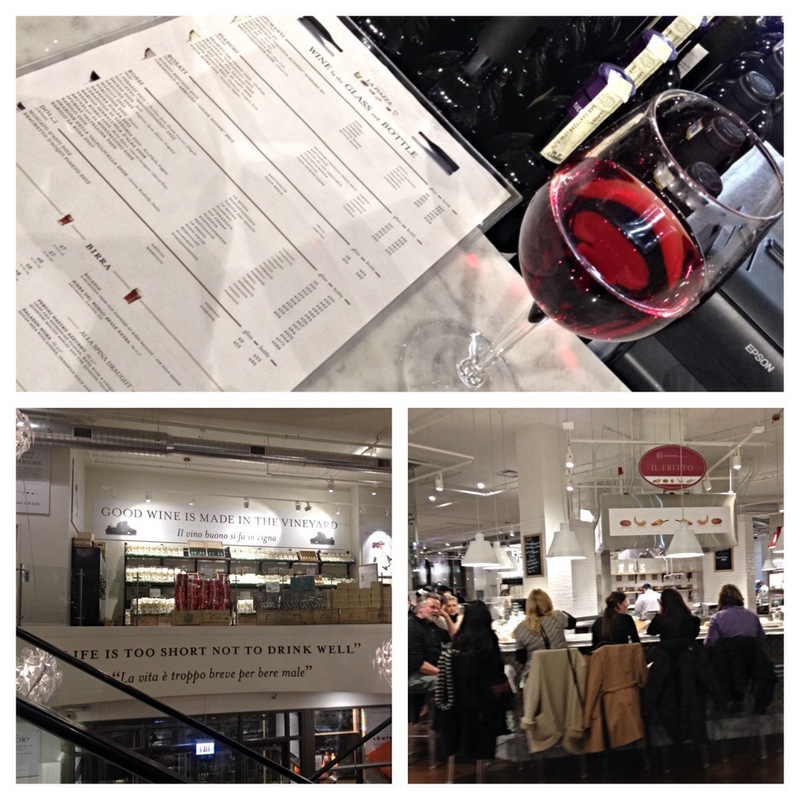 One of the many good things about Eataly: you can drink and shop. Mario, you’re one smart cookie. We then decided to stop at the cured meats and cheese bar. Because I try not to have cow’s milk cheese in January—call it a New Year’s cleanse, of sorts—we ordered a wooden board of delicious cured meats. I found out when I went with Hope (in February, post-cleanse) that when you order the meat and cheese platter, you get sweet jams and honey on the side, too. I dare you to try both! Next, we wandered around, passing the rotisserie bar, peeked in the brewery, and made our way to the refrigerated cured meat and cheese section. I was in heaven. 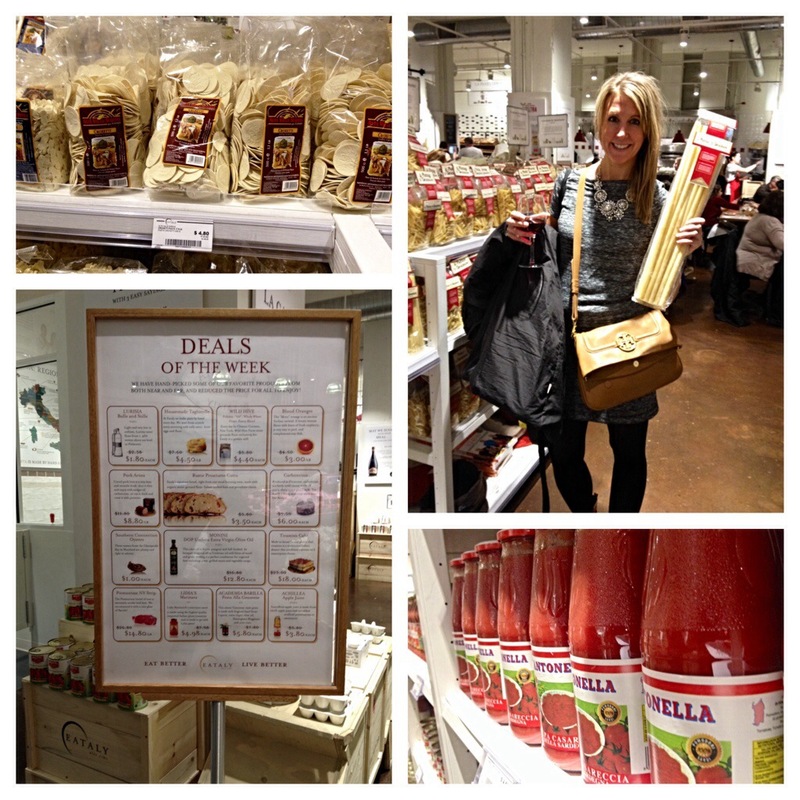 Friends, take note: Eataly is the best place to build the perfect gift basket. 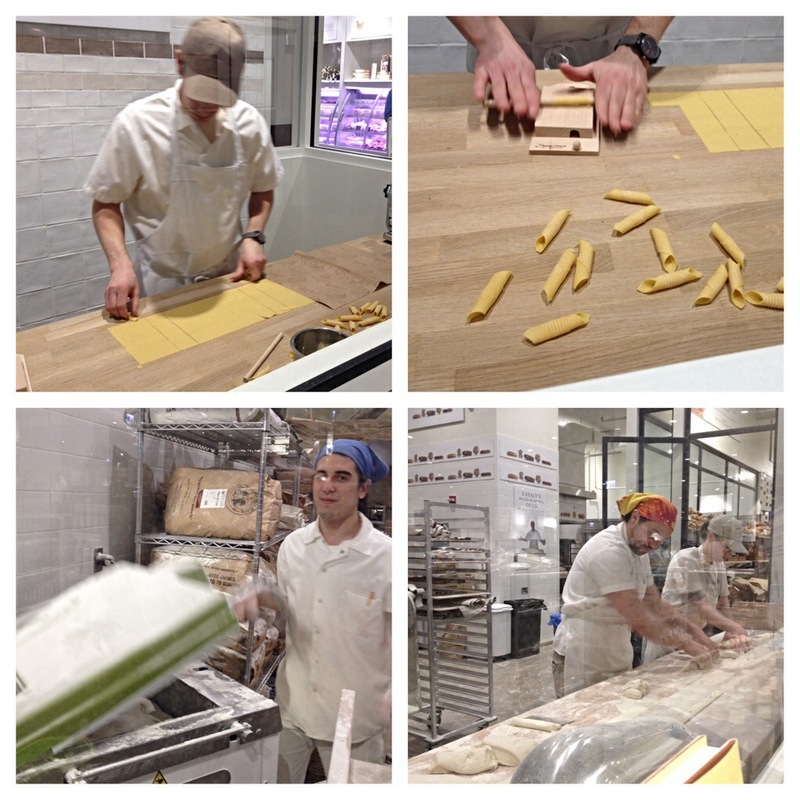 Past the fish and butcher stations, you’ll pass the fresh pastas. During my first visit, I brought home some fresh pasta, as it was part of their weekly special. Yes, every week, there’s a new deal on everything from pasta to fish (Branzino this week!) to toothpaste to pasta sauce. 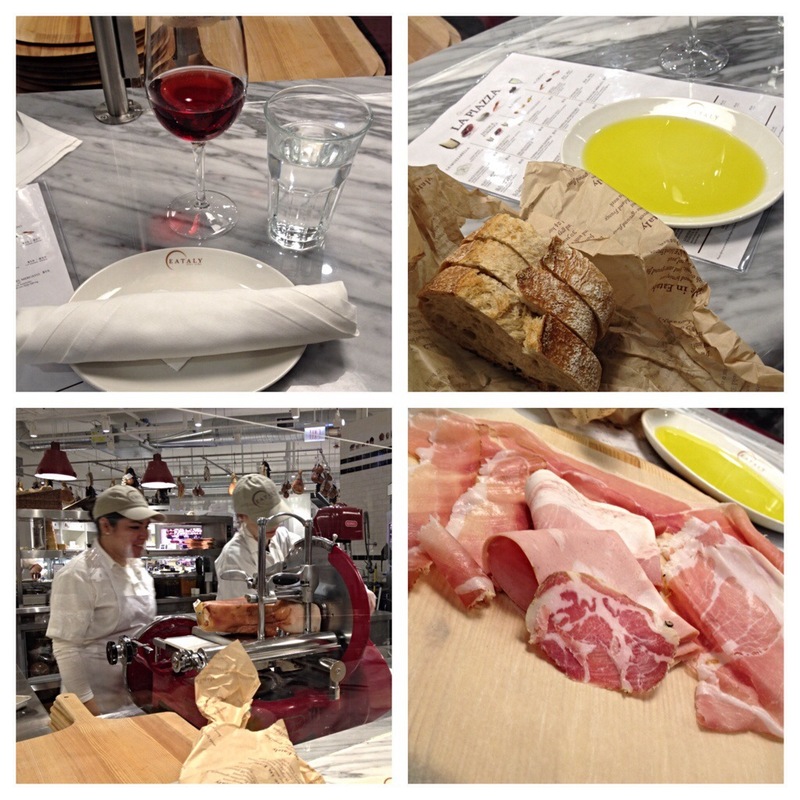 What a great way to sample some of Eataly’s finest! If you’ve ever wanted to see endless varieties of dried pastas, faro, risotto, sauces, pestos, olives—this is where you want to go. 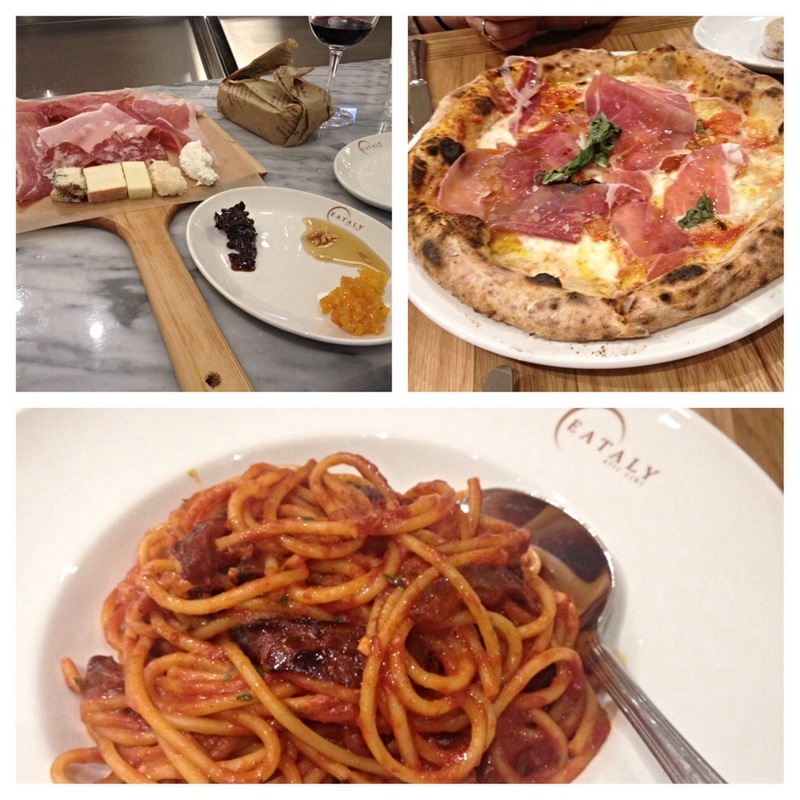 Then, comes the best part of Eataly: the pizza and pasta restaurant. I’ve sampled the pizzas with buffalo mozzarella (apparently I’m not allergic to buffalo milk! ), and had a fresh pasta dish (with mushrooms) and a dried pasta dish (with pork, parsley, and pecorino) from their menu. Not a bad meal yet; although, during my visit with Hope, I was completely stuffed because of my lack of self-control around mouth-watering carbs. 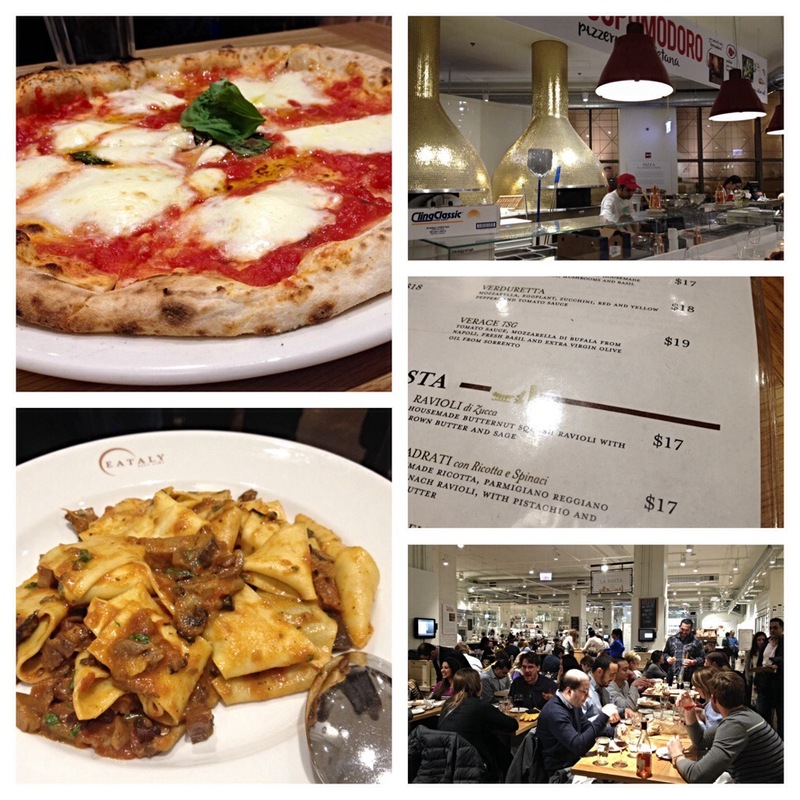 Whatever you do at Eataly, you need to eat at this restaurant. After the carb fest, the rest gets blurry. I blame it on the food coma. There’s a bountiful wine section (as you would imagine), fresh breads (watch the bread makers—they’ll toss flour at you! ), beauty products, and lots and lots of olive oil. Each time I’ve been, I have been too full for dessert; however, why not bring some home for my hubby? First, fresh cannoli, and then a rich semifreddo sweet with a blackberry on top, both packaged to perfection. 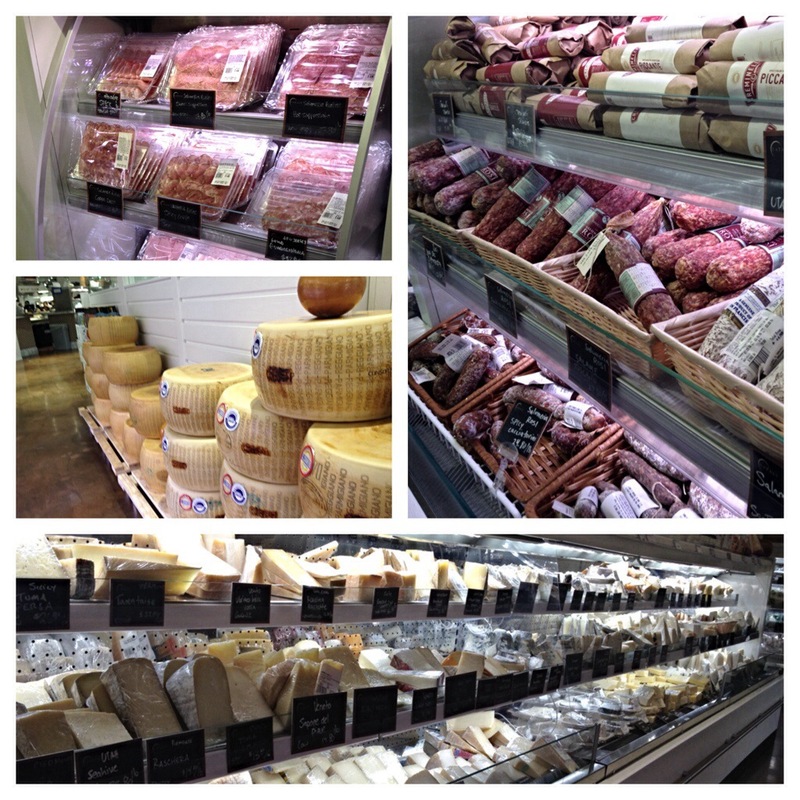 I said it before, and I’ll say it again: go to Eataly. I haven’t even begun to share all of the elements I love about this place, but you have to discover them for yourself. Mangia and salute!